Anette Tarstad creates her own sensitive but strong mix of pop, rock and folk mixed with her storytelling lyrics and her clear strong voice. I’m Not Ready For Love, released on the 1st of November 2012, is the second single from the upcoming album Travel Solo that will be released in 2013. The song is about falling in love, but a love that cannot be. Anette tells that when she wrote the song she saw two good friends sitting in a café, laughing. But it is not only a close friendship, it is also a strong love, a love that cannot be announced, not told. Not event to the friend. Anette tells the story with a clear strong voice in an alternative atmospheric pop. 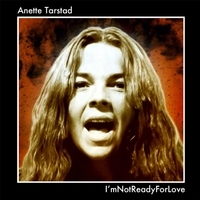 In March 2012 Anette released the first single Maybe from the upcoming album Travel Solo. On both the single Maybe, I’m Not Ready For Love and the prior EPs we find her as songwriter, musician, singer and producer. She continues to explore and deliver a sensitive but strong pop, rock and folk mix with her storytelling lyrics. With the single Maybe Anette Tarstad takes us out in the territory of pain when a relationship might end but where Anette takes us gently by the hand and leads us through the song and the question Maybe? On the Anette Tarstad - At EP, released in December 2008, Anette experiments with both sound and rhythm creating her own sensitive but strong mix of pop, rock and folk mixed with her storytelling lyrics. The EP includes the song Tickin', in 11/8 beats in the verse changing into a 6/8 beat in the chorus. On the record you can hear André Ferrari on percussion, a fantastic percussionist that manages the different beats. On the second EP Pat Flavour, also released in December 2008, with the same name as her band Pat Flavour, Anette explored and found the sensitivity that can be created between a guitar and a voice when they know each other very well and therefore can follow each other and create an exciting mix. The first demo of the song Maybe Wrong Was Right was recorded in the addict of the guitarist Peter Alkeryds house and the sound that was created there was also the sound that Anette kept in the production of the EP when recorded in the studio. The Flute was Anette Tarstads first instrument. But she also sang, and one day her flute teacher, who had heard her singing asked if he could record her. A recording that unfortunately has disappeared. She played the flute in ensembles and at concerts and she started to write her own music together with her childhood friend Anna. Throughout the years she has played in bands, sung in different choirs and written many songs and lyrics both for music and poetry. Anette also has written music for documentaries, commercials and theatre.